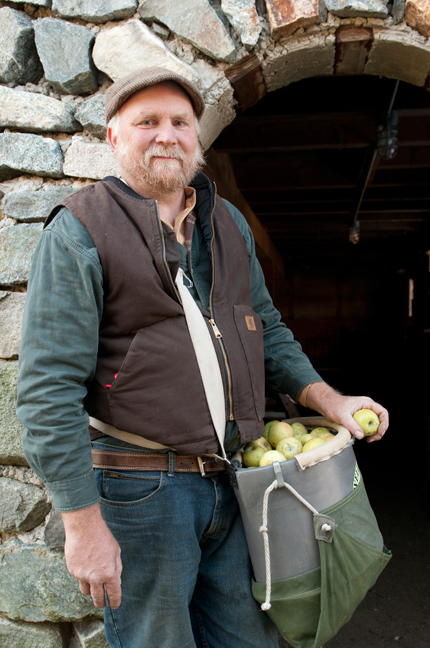 A few weeks ago, shortly after that late October storm pummeled parts of the Northeast, I headed northwest across the state and into the mountains of New Hampshire to take photos for this piece on organic apple growing that recently ran in The New York Times. I always love seeing parts of the state that I’ve never been in. Since much of my work takes me up and down the coast, I don’t get inland very often. The drive was so lovely that the three hours actually went by quite quickly. The thick fog melding with a light layer of snow and punctuated by the occasional tree still dressed in its fall colors soon gave way to a bright, sunny day. It was mid-morning by the time I reached Groveton, N.H., home of Michael Phillips’ Lost Nation Orchard, and luckily, most of the snow in the orchard had melted. Phillips is well known and respected among organic growers (at least based on my random sampling of those here in Maine). His new book, The Holistic Orchard, which will be published in December, will no doubt add to his acclaim in this field. 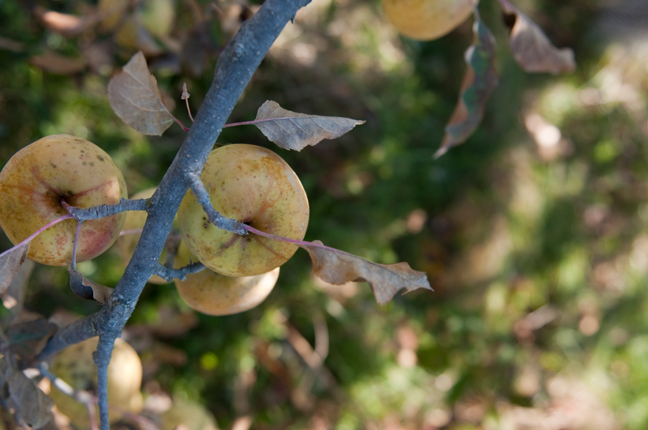 Only a few trees in the orchard still had apples on them at this late date, including this lovely GoldRush variety. Growing fruit organically is still rare enough that a sign seen recently at my local farmers’ market next to a bin of sad, beat-up looking apples read “as close to organic as you’re going to get.” Well, it turns out, this is not the case! There are organic apples out there and they are not only gorgeous, but out-of-this-world delicious (and I mean so tasty that you can easily envision being totally satisfied having one for dessert). However, you have to work hard to find them. Wouldn’t it be fantastic if this was not the case? Apples routinely top the list of pesticide-tainted fruits and vegetables, and while most apples tested are below the EPA’s levels of concern, call me crazy, but I have a hard time imagining that consuming trace amounts of pesticides is good for you (not to mention what they do to the environment). 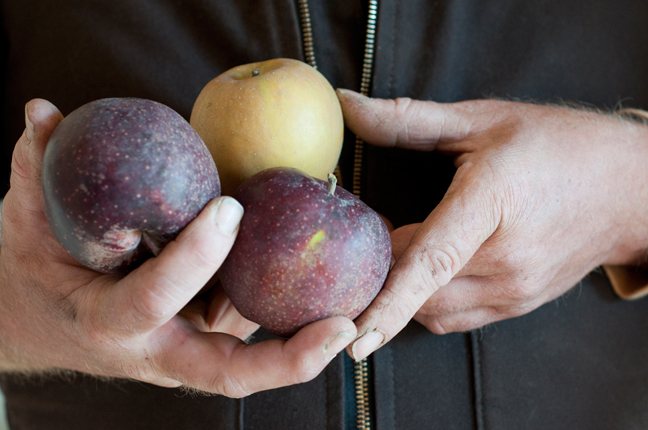 You can help encourage more orchards to grow organically with your purchasing power. Seek out organically grown apples whenever possible. (There’s a good list of orchards who emphasize health in their farming practices here). Trust me, you won’t be sorry. 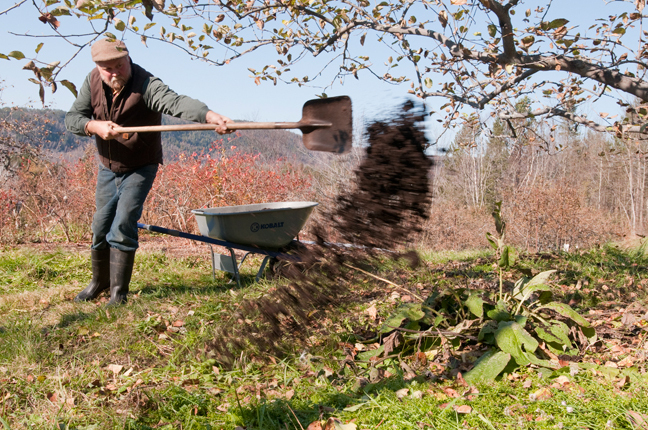 As part of the process of organically nourishing his apple trees, Michael Phillips lightly spreads a compost of manure and deciduous wood chips under the drip line of the tree (the circular area at the outer ends of the branches) each fall. I had the pleasure of seeing the loving care Phillips puts into his trees, as well as tasting a selection of the more than 80 varieties of organic apples he grows. I have honestly never tasted such incredible apples. They all had such distinctive flavors, but my favorite on this day was also possibly the most beautiful one—the Black Oxford. At once sweet and tart, this dramatic purpley-black fruit is satisfyingly crisp. As if that weren’t enough to make it my new favorite apple, I then learned it originated in West Paris, Maine, in the late 1700s! Oh, if only I had a stockpile of these for the winter, I’d be one happy organic apple convert. 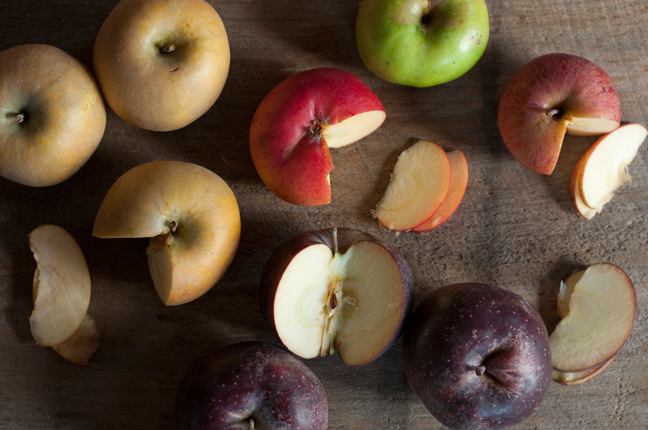 Among the 80 varieties of organic apples that Michael Phillips grows are (clockwise from upper left) Golden Russet, Erwin Bauer, Rhode Island Greening, Cox’s Orange Pippin, and Black Oxford. 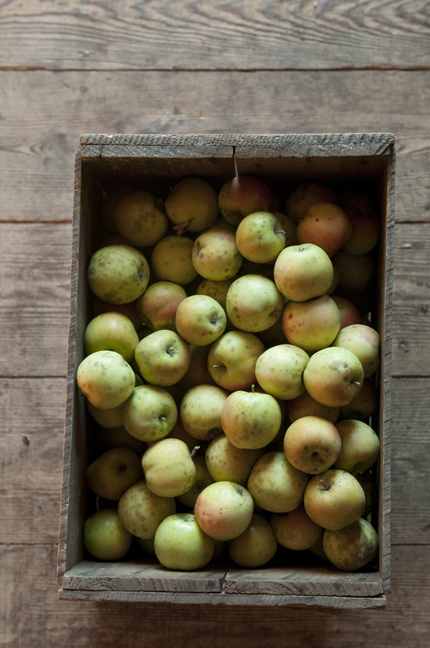 GoldRush apples are considered a great holiday dessert and cider apple because of their high sugar content. This entry was posted in apples, farming, food, The New York Times and tagged Black Oxford, Cox Orange Pippin, Erwin Bauer, Golden Russet, GoldRush, Groveton, heirloom apples, Lost Nation Orchard, Michael Phillips, N.H., organic apple growing, Rhode Island Greening, vintage apples on November 21, 2011 by Stacey Cramp.